The photographs are stellar. 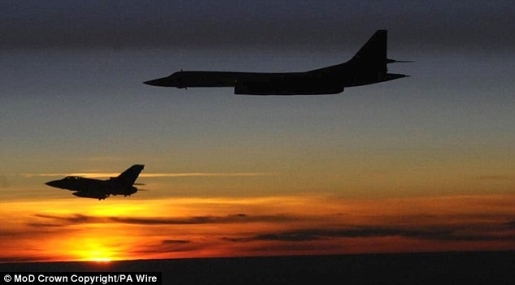 Two Russian Tu-160 Blackjacks, long-range bombers, were intercepted in British air space by two RAF Tornado fighter jets from the RAF’s 111th Squadron, based in Leuchars, Scotland. The four planes flew alongside one another, patiently, until the Russian jets made a turn at Northern Island and left the UK’s sovereign skies. Pretty nerve-wracking stuff, right? Apparently, it’s business as usual to tail the Russians on a tour of England. While it’d freak out the general public if they heard about it, this event is nothing new to the British Royal Air Force. According to Wing Commander Mark Gorringe, this happens all the time: “This is not an unusual incident, and many people may be surprised to know that our crews have successfully scrambled to intercept Russian aircraft on more than 20 occasions since the start of 2009.” Apparently now that Russia has all that oil money, they want to show off.